The best way to get laughed out of the UFT Delegate Assembly is to ask about lowering class size limits. “The City will never buy it”, “it’s that or your raises, nobody is willing to give anything up to achieve that” etc… I certainly know teachers who would be willing to make some trades for lower class size limits, but more to the point, there’s no reason they should have to; we CAN demand more, we just have to be willing to back up our demands with action. At those same Delegate Assemblies, we frequently hear about the heroic Founders of the union, and how they went out on strike (illegally) to win the rights we currently enjoy. That we have class size limits at all is testament to the power of the militancy of the UFT Founders who were willing to take risks and picket, agitate, and strike for the good of the union, their students, and public education as a whole. Suggest that we do the same today to lower those limits for the first time in 50+ years and you will be dismissed as a deluded radical. Boycott of Staples Still On! 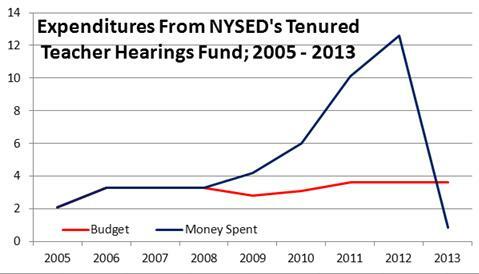 So Why Did the UFT Spend $171,163 at Staples Last Year? The UFT passed a resolution joining an AFL-CIO boycott of Staples to protest the use of nonunion workers to operate new U.S. postal counters in its stores around the country. “It’s important for us to stand in solidarity with the American Postal Workers Union,” Vice President Janella Hinds said in support of the resolution at the June 2014 DA meeting. Additionally, the AFT (and NEA) had also called for a boycott of Staples in response to requests from the American Postal Workers Union and even led a huge rally at the 2014 AFT Convention. Educators are encouraged to take advantage of the many deals on school supplies being offered throughout the city and online. The UFT supports the boycott of Staples, which is taking jobs away from unionized U.S. postal workers as the U.S. Postal Service outsources its work. So why did our union spent $171,163 with Staples in Fiscal Year 2015 as reported in the UFT’s LM-2 FORM – LABOR ORGANIZATION ANNUAL REPORT for FY 2015? Was this an oversight? We’d like to know. We have, in the past, noted how New York City has moved to fired almost five times the amount of teachers that the rest of New York State has combined. In addition, we have highlighted how the city has spent the majority of $32.8 million (of state money) on hearing officer fees alone to do so. For too long have we seen our colleagues removed from their duties, shamed in the press, abused in the workplace and silenced by a process that serves only to keep them silent. Today, we share the story of one of those teachers and declare our support of her reinstatement to full duties as soon as possible. Last March, the case of Christine Rubino was argued in front of the Appellate Division of the New York State Supreme Court. The judges’ unanimous decision, released just last week, revealed what real educators had been saying all along: A teacher with a spotless service record for fifteen years should not be fired for making one inappropriate comment on her Facebook account. Christine Rubino had been fired (and humiliated in the press) after making one single dumb remark on Facebook several years ago. She sued to get her job back in the NYS Supreme Court and she won. The judge sent Rubino’s case back to the original hearing officer for a more lenient decision. The hearing officer then issued her a two-year suspension without pay. She appealed that suspension, because she felt it was too harsh (so do we) in front of the same judge who had overturned her original termination. She lost that appeal. The department however, appealed the original decision reversing her termination to the New York State Appellate Court. The argument made by the department was that the judge, the one who had ruled in Rubino’s favor the first time (the one who had sent the case back to the hearing officer), but ruled against her the second time had erred with her first decision and that Rubino should, in fact, be fired. The justices did not agree. Anyone who’s familiar with Christine Rubino’s case understands it for what it is: A classic story of an employer playing the blame and shame game for keeps and an employee, also playing for keeps, who just won’t give up. Wherever you are in this scenario, whatever side you’re on, you have to admit that the case of Christine Rubino is at once breathtaking, captivating and terrifying to behold. For us, it is unacceptable. A large part of the attack on teachers is that too much of our lives, both in and out of the classroom, is held to a level of scrutiny that is intolerable. This scrutiny has but one goal in mind: To create a climate of fear and intimidation among New York City’s teachers. And teachers’ lives are destroyed as this goal is pursued. The toxic environment results from this fear fear creates is just what these people want and it leads good, proven teachers like Ms. Rubino, to be fired. Not only teachers, but all workers should have the right to privacy outside of their jobs. This privacy was not afforded to Christine Rubino. If it had been, she would not have been investigated in the first place. All workers should have the right to due process that is fair and appropriate to the accusation or act. While New York State’s termination process for educators, called 3020-a, provides a due process path, it leaves many infractions undefined, allowing our district, New York City, to pervert the process into a game which serves to publicly humiliate any teacher who, even once, steps the least bit out of line. Teaches, and all workers, deserve a disciplinary process that is fair and provides for support and development of employees rather than immediately turning to the harshest of penalties that can be dealt. Let us be clear: What she said was a poor choice and a lapse in judgment. But she never had once had an incident of unprofessional conduct before this act in fifteen years of teaching. This one isolated incident does not identify Ms. Rubino as a teacher. Her fifteen years teaching countless students, however, does. That is why the Movement of Rank of File Educators is standing firmly behind her and will be alongside of her through the conclusion of this ordeal. Regardless of what side of this fence you’re on you should know that it didn’t have to be as complex or as involved or as strange or complicated a story as it wound up being. This one act, written by a woman who had never been in trouble her whole career, generated no less than one formal disciplinary hearing, two hearing officer decisions, two Supreme Court decisions, one Appellate Court decision (possibly another), and very probably, one decision from the highest court in New York State: The Court of Appeals. Department lawyers have made their career on Rubino’s case. Judges and hearing officers have been able to book long vacations with the money they’ve earned hearing and deciding her professional fate. At one time, newspaper reporters and editors considered her’s the ‘go to’ story during a slow news week and many interested parties have spent many a difficult hour wondering where the proper precedent of her case, sure to effect teachers across the entire state, should be set. All for one comment, made on one day in June. Pundits take note: This is how the nation’s largest school district treats its good teachers. It humiliates them in the press. It moves to fire them, then fights tooth and nail to make sure they stay fired. But also note that they will no longer be facing this shame and abuse alone. We urge the department to accept the decision of the court and let Ms. Rubino go back to work. Ms. Rubino has won her case at the appellate level with a unanimous opinion and the Court of Appeals is extremely unlikely to even agree to hear a department appeal, much less overturn the decision. Any further action by the department would be a waste of time, energy and our taxpayer money -money that could be spent teaching children. Efforts to keep her fired should be dropped and she return to her to the classroom where she belongs. We further call upon our brothers and sisters who lead the union to step up to the plate and work out a final resolution with the department -one that includes Ms. Rubino’s return to duty next month, at the conclusion of her suspension . We are not concerned with arguments as to whether leadership is weak or unwilling to protect teachers like Rubino. In fact, given the current political climate, we certainly know that it is no small task. But when we hear of the stories of other teachers, like Francesco Portelos, and Harris Lirtzman, we conclude that there is a need strengthen, not weaken, collective bargaining protections for teachers in general, and for Ms. Rubino in particular, so that one inappropriate comment, made from home, (after a fifteen year spotless record of public service) does not immediately lead to termination.